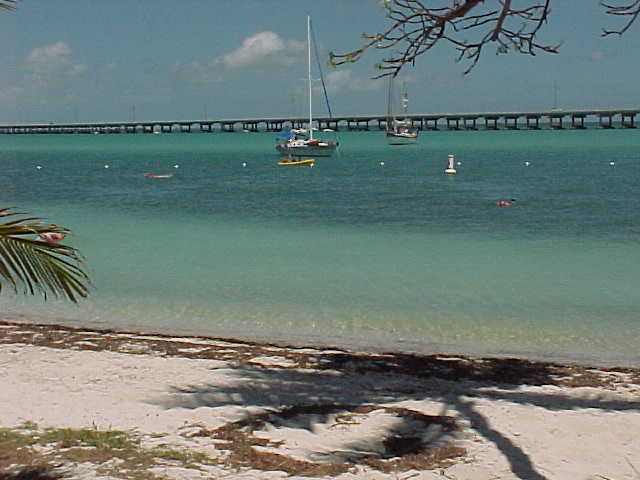 Bahia Honda State Park and Recreation Area is located at Mile Marker 37. With its white sand beaches and abundant wildlife, Bahia Honda Key frequently makes the list of the top beautiful beaches in America. 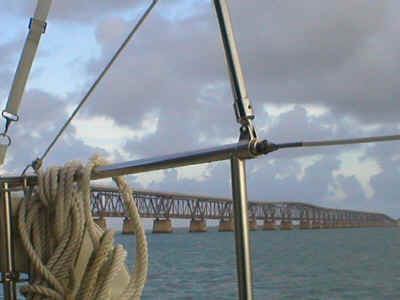 Here we are anchored in between the bridges (you can see only the new bridge (Overseas Highway) in the shot below. It's a glorious anchorage. You can see the beach swimming area roped off and how close September Sea is to it. Someone is puttering by in a yellow inflatable dinghy. This next photo you are looking at Overseas Highway in the background (Overseas Highway divides the Atlantic from the Gulf of Mexico). Friends Chris and Yanni aboard s/v Magus are shown behind us at left. We really have a wonderful time at Bahia Honda. There is a huge State Park, RV Park, Shower facilities, BBQ grills and picnic tables right on the beach on which to stir up something tasty, and a roped off swimming area, and people in the water enjoying their day. It's just a breathtakingly lovely place. Above, a picture of the old bridge, as seen through our aft cockpit. Flagler's Masterpiece. Water vessels come from the Atlantic side through an opening of the bridge. 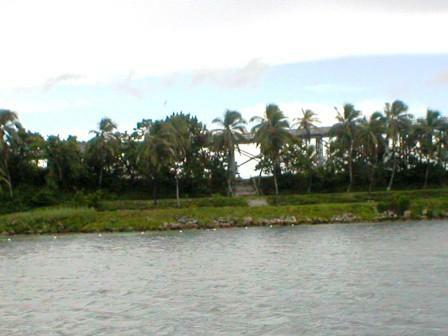 This bridge is no longer in use, as it was replaced by the Overseas Highway Bridge. 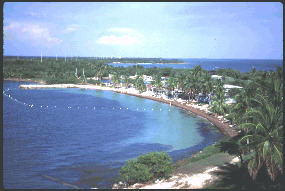 Below, the entrance to and exit from Bahia Honda for sailing vessels. 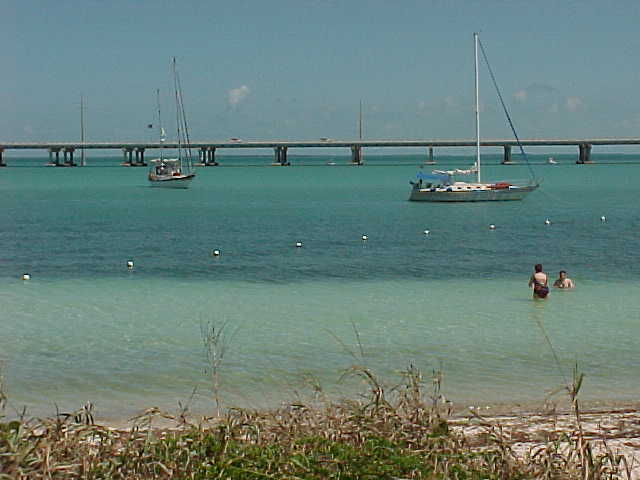 The center where Bahia Honda is located, in between the bridges, is still the Atlantic. Once you cross under the Overseas Bridge, you are on the Gulf (of Mexico) side. It's really a special place where you have two glorious bodies of water within a stone's throw of one another. It really is a lovely place. This area has steps so you can walk up and on the old bridge. We've seen people jump from the old bridge down into the water. I'd not recommend it as sport. The water around the bridge is shallow... and bull sharks love to hang out there right under the bridge. We've snorkeled here and never had a problem, and the beach is nearby too. However, it is not recommended that one swims or plays in the water directly beneath the bridges. Lots of people fish there and the bull sharks have learned they can get a lazy meal just by waiting for a fish to be hooked. Then, as you're pulling the fish in, you're often lucky to be left with anything after the bull sharks get hold of it. Above & Below: Anchored out in Bahia Honda Paradise. Does it get any better than this? I must say... well... yeah, it DO. Ridiculous, huh? Our sail flaking looks terrible in the photo above, but trust me--it's the angle! This She-Captain would never allow her sails to look ratty! Bill does a great job via a few lessons when we first came down here, from our dear friend Sir Charles, who is (hands down) -- King of the Flaked Sails. The Keys are known for their beautiful sunsets. What other place has the sun rising on one ocean and then setting on yet another? Just spectacular sunsets. Such beauty the whole world should know. If you haven't, you must get down here to the Keys! September Sea preparing to leave the anchorage after staying there a couple of days and nights. Above left, Bill pulls up the anchor. I was trying to get some info on Bahia Honda state park. I called the park and they said that holding was VERY bad in the park. I guess two sailboats went aground during a storm that blew through??? My captain.. Ray... has been sailing for 30 years, so I dont think we would have a problem. Hes a (dive over and check the anchor) kinda guy, but was wondering about your advice. I saw your pics and we are extrememly excited about our sail there in April... the marina has a controlling depth of 3 1/2 feet so thats a no go for us.... we like to anchor out anyway, but like to dinghy to shore for the laundry stuff.. any suggestions??? 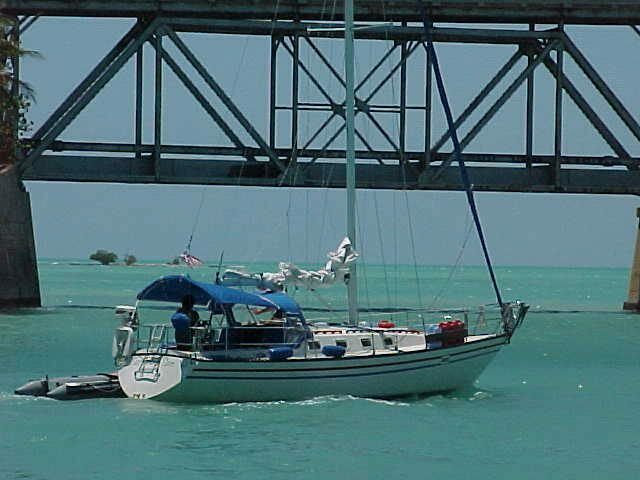 Hi there Kim, The potential problems with Bahia Honda is that you anchor in between two bridges (the old railroad bridge and the new highway bridge). You can imagine what could happen in a big blow... with no where to go. It's not a very large area inside the two bridges. 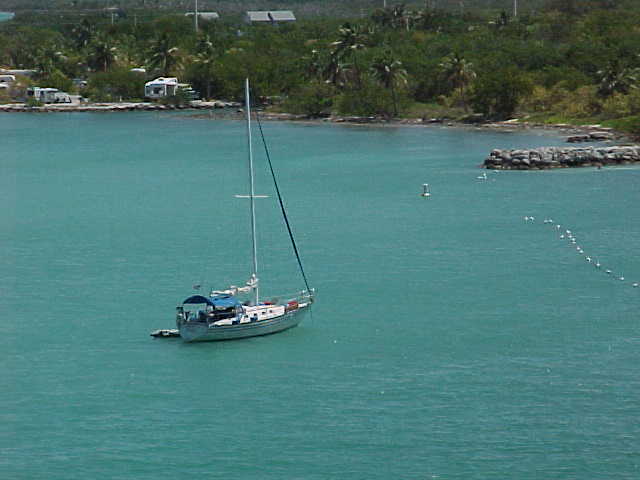 The holding in Bahia Honda is comparatively poor to other areas in the Keys; but stay near the swimming buoys and there is plenty of sand and grass for your anchor to take hold. Most of the people we have known who have dragged did so because they anchored in the wrong areas there. Otherwise, you should do fine. When backing down on the anchor (with about 30 ft. of rode out), once you feel it grab, give it another good, quick tug revved around 3000 RPMs. When the bow pushes DOWN with a resounding jerk... you know you're set tight. After that, let out the remainder of your rode and have a Mojito. The "gust" that came through here the other night was a 60+ knot wind that was sustained for at least five minutes. So, in all fairness, many anchors would have dragged with such a wind as the other night. You would have to really been dug in. However, I'd guarantee you that my Spade anchor would not have budged. Hope this helps. 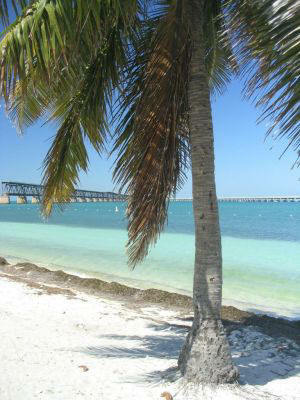 You'll love Bahia Honda. It has lots of places to walk to... you can dinghy around to the marina and tie up at the store there, get water, etc. Just don't dinghy up to the beach as it is not allowed. One other note: Watch the entrance carefully as there is a shoal (island with a tree) right before the entrance and it's hard to see from a distance. It's marked on your charts but in real life it can sneak up on you. Stay to the western side of the entrance as you approach and you'll be just fine. Thanks for the great info. We would love to meet you on our way through. anchoring in the Keys. We have never done that, always just 1 anchor. Do you find it necessary and if so, what method do you use? 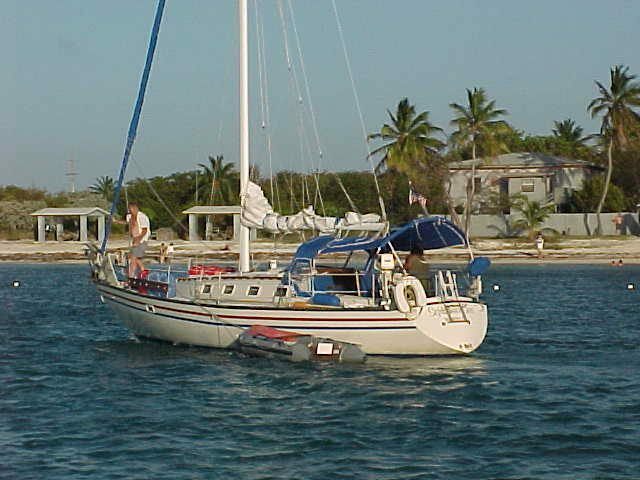 A Bahamian moor is not a bad idea for this area because the biggest problem with using two anchors is that as the current turns your boat round and round your anchor rodes will twist together and cinch you too far up to your anchors. When this happens, someone else may come in to anchor and anchor way too close to you, not realizing your scope isn't even out until you untwist and suddenly you are 50 ft. closer to them than when they came in. You see what a problem that can be. By the same token, when you wish to anchor in a frequented area (say, inside the Harbor) note the anchor rodes of the boats around you. If they are twisted up then you have no way of knowing where that boat will settle once it untwists. Stick near boats that either only have one anchor out or that otherwise show no sign of twisting (which means either they use the Bahamian moor or they are dilligent in keeping their rodes untangled). With the Bahamian moor it limits your arc when swinging and when you do twist with the currents it will untwist on its own because of the pull between the two anchors in this particular arrangment. Too, instead of swinging the full length of your scope you will only swing nearer to the actual length of your vessel. The Bahamian moor is very excellent for using to take advantage of a tight spot others will pass on and look elsewhere for more room. I looked up the best explanation of the Bahamian moor technique and have it printed below. I would recommend setting your kedge (second) anchor with your dinghy and retrieving it with your dinghy as well. Makes it all so much easier and more manageable. Be sure to follow the instructions to the letter or it won't be effective. The great thing too, which the article really doesn't explain, is that with the two anchors in opposite directions you won't have to worry about one pulling out with a change in tide direction or sudden wind shifts. This time of year we have squalls that come up rather quickly. September Sea has no need for using two anchors as her anchor is a 44 lb. Spade (Spade is the brand name, not to be confused with anchors that simply look spade-like) that digs to China and has successfully held us in place in over 60 knots without moving an inch. It also will not pull out no matter what direction the boat swings or pulls. Its anchor will only free up when the bow is driven forward overtop and beyond it with substantial power. That scenario could never happen in a blow. The Spade anchor is worth its weight in gold to me. After it is set, I simply forget about it. It's security is akin to being tied to a mooring ball. 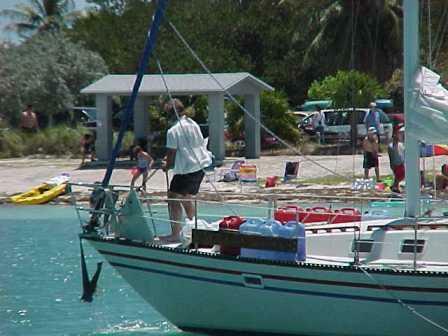 I give tips on setting an anchor under "Adventures" select "Bahia Honda" to read. A note of caution: I do not recommend Danforth anchors for the Keys. They let go in a blow and will find it quite difficult to reset and hold you. Especially if you are in a high profile trawler. The more windage you have the anchor holding you need. People often buy anchors for fair weather not realizing they need to purchase a storm anchor. No one ever went topside and put out a storm anchor in the middle of a blow...too late! So start out with the biggest baddest anchor you can physically handle and that is your every day anchor: sun, rain, or storm. Then it is there and in place working for you when you NEED it. Strictly and traditionally speaking, to moor is to secure a boat with two anchors whose rodes lead in opposite directions, or nearly so. A boat is not moored when she lies to one anchor only, or even to two anchors lying ahead; she is then at anchor. (In modern parlance, mooring connotes any semipermanent anchoring system.) If you’re planning to leave your boat unattended for a while in an anchorage, both you and she will be happier if she’s moored. Some insurance policies will cover your boat if she’s moored but not if she’s at anchor, so be sure you understand the difference. To begin the Bahamian moor, set out your bower anchor—your largest working one—in the direction of the prevailing wind or the strongest current. Drift back to the full extent of the anchor line, and drop your kedge anchor. Then haul in on the bower line, snubbing the kedge as you go to set it into the ground, and center the boat between the two anchors. Now make the end of the kedge line (usually nylon) fast with a rolling hitch to the bower rode (chain or nylon). Ease away the bower rode from the bow roller until the kedge line is well underwater—deep enough not to foul your keel when the boat swings.In effect, you are now made fast by the bow to a line stretched between two anchors, and the advantages are that your swinging circle is greatly restricted and your rodes cannot foul their anchors.In practice, don’t try to make an absolutely taut line between the two anchors. Leave some slack so that when the wind comes from abeam, the rodes will lie to windward in a shallow V shape and relieve the anchors of considerable strain. Incidentally, it’s not always as easy as it sounds to join the kedge line to the bower line. The longer the length of kedge line above water, the more awkward it is to work with. It’s easier if you work the spare line into a tight coil and lash it with a light line to prevent its unraveling before you try tying the rolling hitch and submerging it.If you have a dinghy, simply anchor with the bower from the bow on a scope of 5 to 1 or so, and take the kedge aft in the dinghy to the full extent of its rode. Then tie the inboard end of the kedge rode to the bower rode and lower the join into the water as before, leaving the boat to swing freely from one rode passing over the bow roller.When it’s time to leave, if you can’t recover the kedge with the dinghy, buoy the end of the line and throw it overboard. 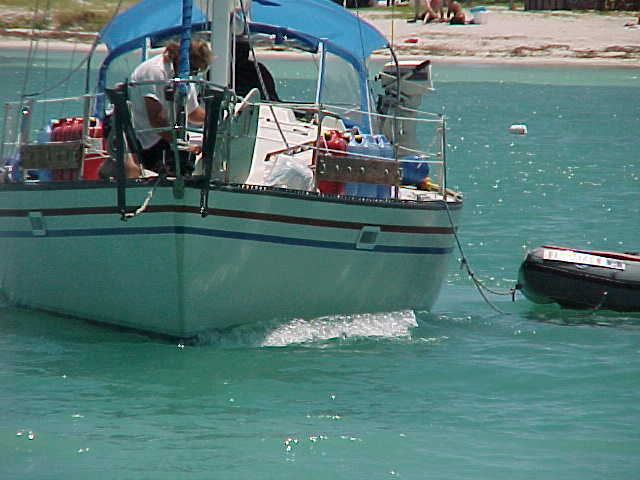 Weigh the bower anchor as usual, and then recover the kedge from your boat. Bill and I look forward to meeting you and Gina. 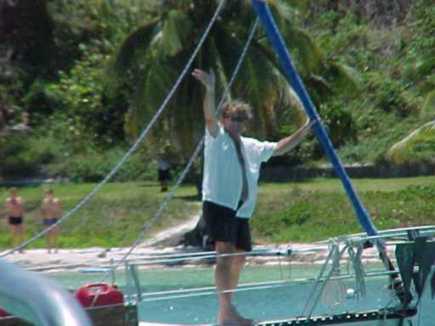 Bill waves: "Bye for now, but we'll be back soon!"